Retro red alarm clock with glow in the dark hands. Easy to operate, with on / off switch on top. Measures 11 x 9 cm. Requires 1 x AA battery not included. 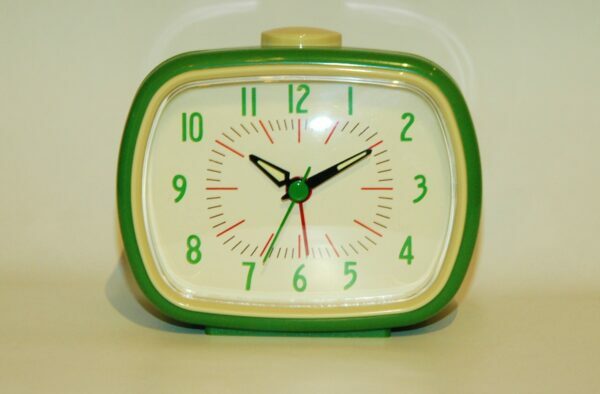 Retro style green alarm clock, making getting up in the morning much easier! Who wouldn’t have a smile on their face when they’re woken up with this charming retro alarm clock! Featuring a great mid century design this would make a great gift for a birthday. Easy to use, and great for adding a pop of colour and retro flair to your bedroom, this alarm clock also makes a great gift for children learning to tell the time.